I have some major swatching backlog going on, but my daughter is off today for a Teacher In-Service day so that can wait until tomorrow. My NOTD is one from a discontinued UK line by L'Oreal called LaquiResist. 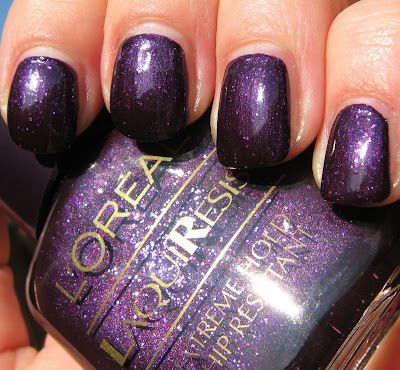 Supernova is a red-based purple shimmer filled with multi colored and multi shaped glitter. 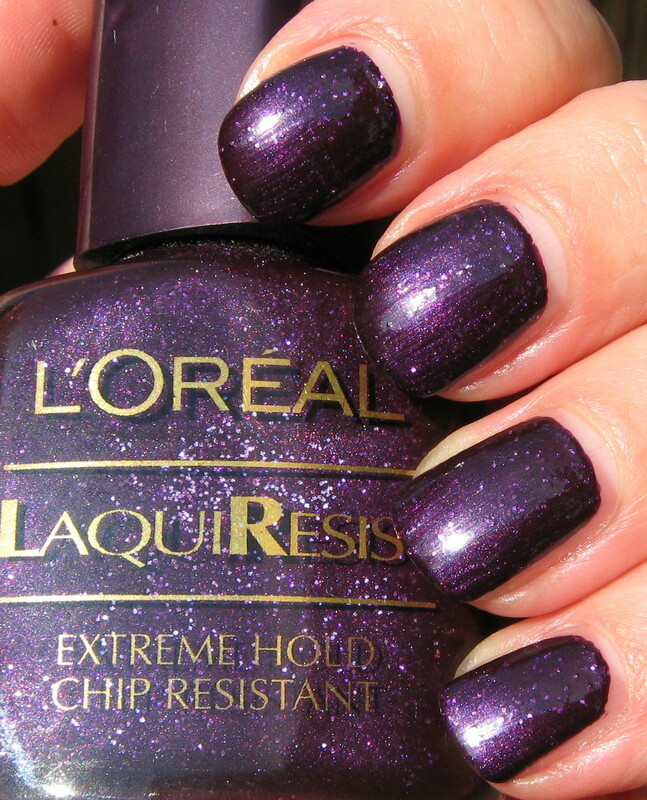 I used two coats with no issues, and enjoyed sniffing this chemical-laden hard-to-find polish the entire time! I picked mine up from a blog sale a couple of months ago that Jessica was having, but they do show up on eBay once in a great while. A quick Google search also lists some UK sites that carry some shades from this line. If you have any polishes from this line, I'd love it if you'd share your thoughts and/or recommendations on them! beautiful! sad theyd ont work on it anymore. Never heard of this line from L'Oreal. Very pretty shade of purple. Different shaped glitters are perfect. Super Nova is just that, Super amazing color! Love the red-purple that shimmers. There's so many new colors coming out in collections. I wish I knew where you can find this. Maybe off Loreal web site? Discontinued shades, maybe? Nameste. Thanks for sharing!